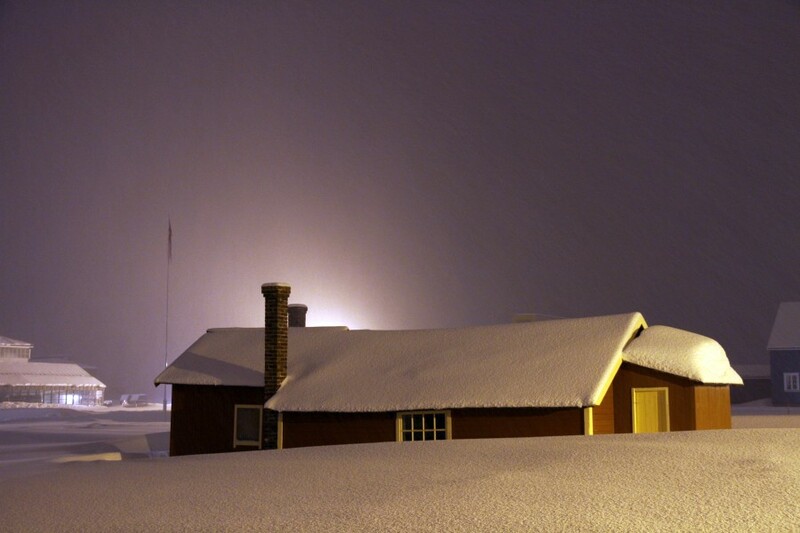 It may be common courtesy to switch the lights off when you leave a place, but nothing really behaves the way you expect during the polar night. So as our stay in Ny-Ålesund comes to an end we switch the lights back on in the Marine Lab and the harbor. Some intense weeks on Helmer Hanssen and in Ny-Ålesund are over. 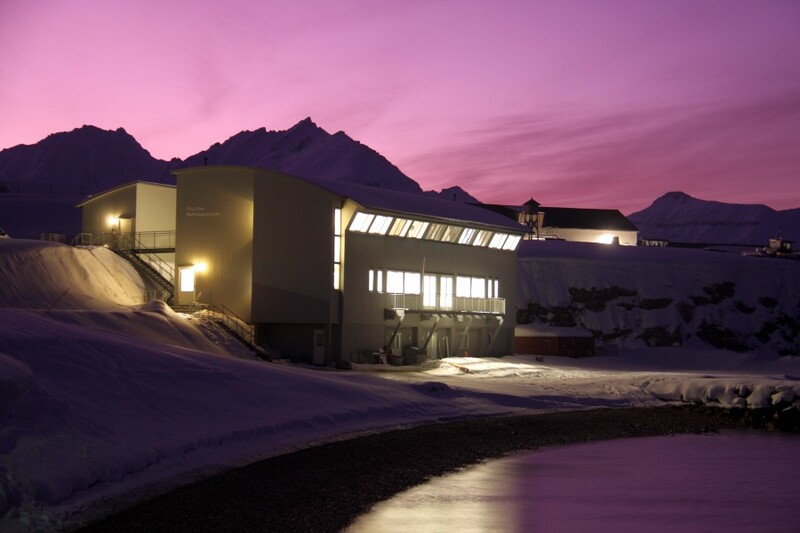 The Marine Night participants are back at home (or at UNIS), trying to make sense out of the massive amount of data that has been collected during the campaign – to shed some light on the dark of Polar Night. Thanks to all participants, for making this Polar Night campaign such a great success! Thanks to Jørgen for getting it up and running, keeping control of all diverging interests and the first-time ever “underwater robotics in the Polar Night” course. Thanks to Kings Bay in general and Sebastien Barrault of the Marine Lab in particular, for supporting us with all our weird requests and turning the entire harbour area into a pitch dark Polar Night laboratory. Without their cooperation and help this project would not have been possible. We end this blog with some pictures of the Marine Lab in a way none of us has seen it during the last weeks – in bright light, inside and outside. Final day in the field, and all goes down into boxes. 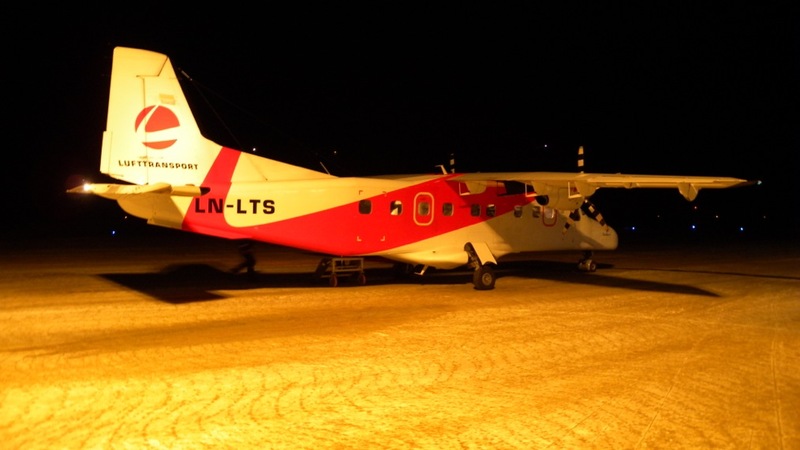 This morning two planes loaded with students, researchers and equipment left Ny-Ålesund for Longyearbyen. Left here in Ny-Ålesund were only the last 15 people with the questionable pleasure of sorting out all the leftovers and last pieces of equipment. Fortunately, we have a German and über-organiser with us to create order out of chaos – Daniel Vogedes. Actually, the packing reminds me of the pub-night we had on Saturday – a few of us (Paul, Eva, Gerald and myself) left the remanding party for a game of pool. While playing, we quickly realised that we were all stunningly lacking any talent for handling balls with a long stick. In fact, it was as if entropy would have been a better strategy than any f us aiming at any of the 6 pockets. And entropy is what would have ruled the day of packing had it not been for Daniel – thanks to him things came into their correct boxes and (in more or less an orderly manner) onto pallets. 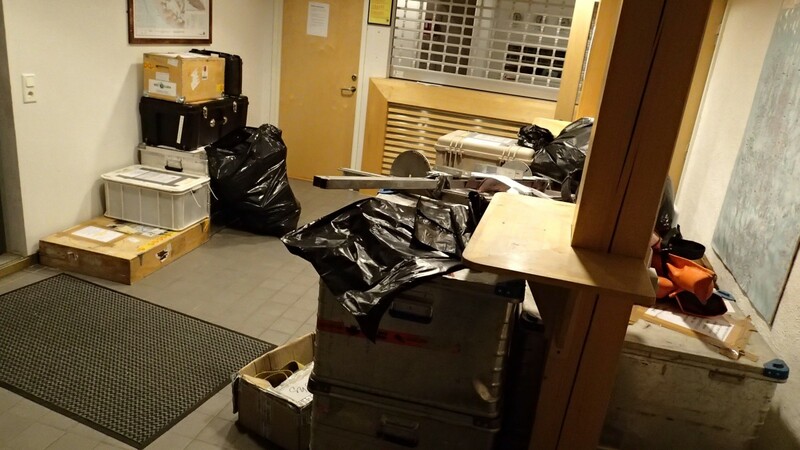 All in all we have now packed some 1500kg of equipment in loose boxes that will go back to Longyear by plane and 11 large pallets of additional equipment that are to be sent back by boat – the coastguard will kindly bring them back to Longyear in February). In addition to this, is of course all personal luggage for all 60+ participants. All in all, quite a circus…with Daniel in the middle hurding people around with a whip in his hand! Anyway, we are on our way home. We have had some 900 researcher days in the field over the last two weeks, and we have all but emptied Kongsfjorden for zooplankton. 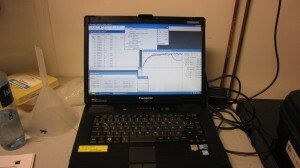 We have used and successfully tested prototypes of purpose-built light sensors that for the first time have made it possible to character size and quantify the changing light that affect all organisms in the ocean during the polar night, and we have successfully used a wide range of underwater automated platforms to study the patterns and processes that characterise the marine polar night. 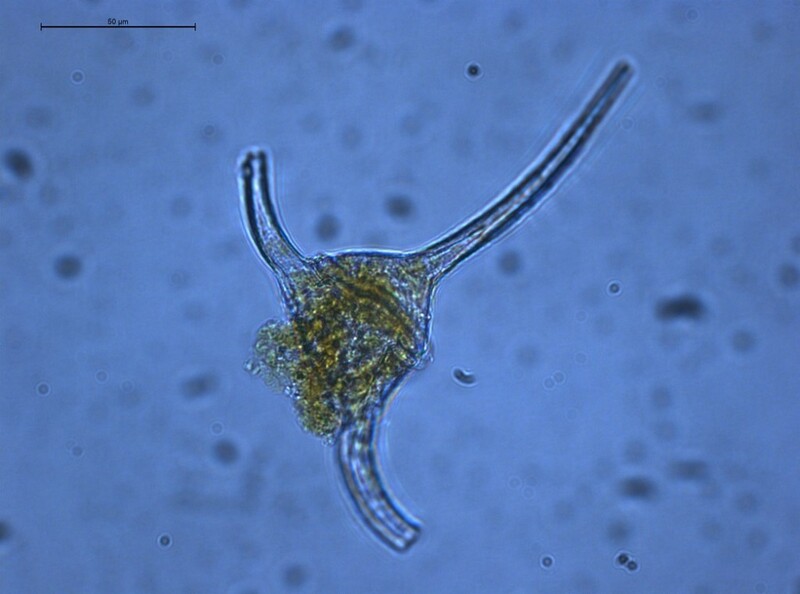 We have collected unrefutable evidence for werewolf activity among Arctic zooplankton, and we have unique data on the diet of seabirds that are found up here in the dark. And, finally, we are all returned unharmed and safe! The coming months will now be filled with data-handling. lab-analyses and writing up as much results as possible. 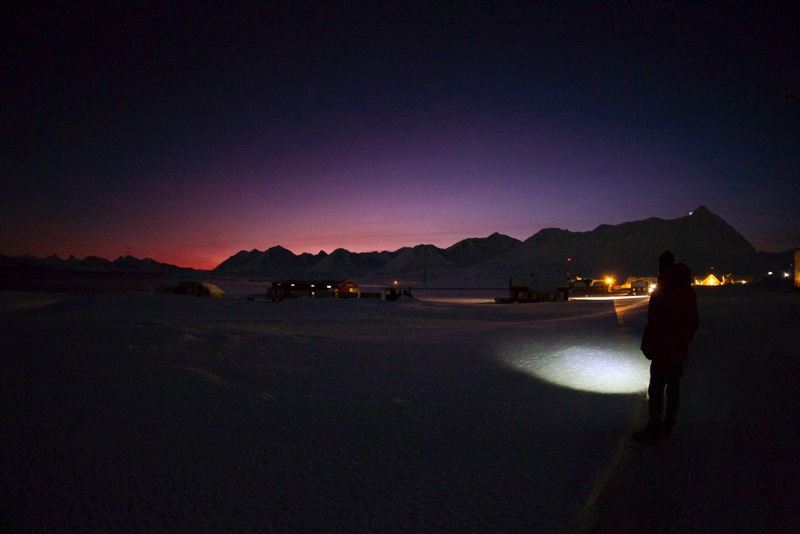 After all, it is not more than 345 days until a new polar night adventure starts in January 2015! I long believed that this sentence, from a Spanish song by Fito & Los Fitipaldis, did not make much sense. The best of the sun is its own brightness and wonderful warmth. 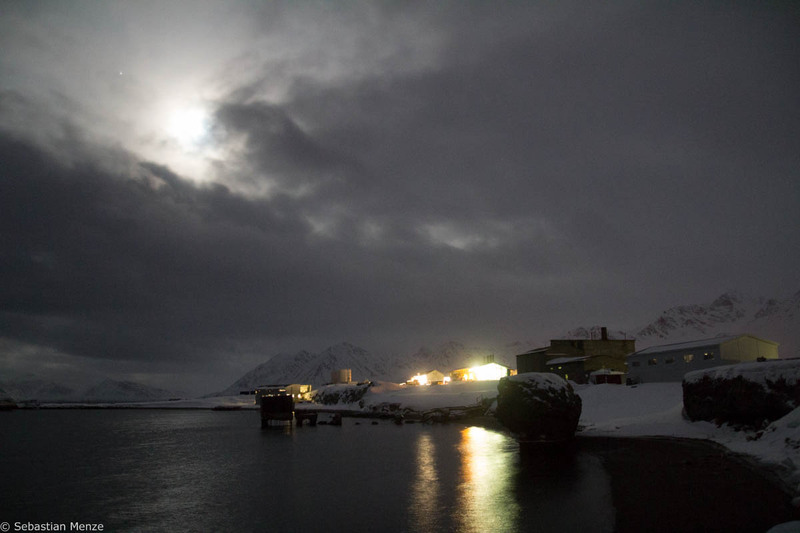 After spending a month of January in the complete darkness of Svalbard – first on board the research vessel Helmer Hanssen and then at the Kings Bay Marine Laboratory in Ny-Ålesund – I discovered the true importance of the Moon (see other blogs). Also, thanks to her we have been able to enjoy amazing landscapes. As I have learned from Kim Last (a visiting scientist from SAMS in Scotland, a specialist in biological clocks in marine animals) moonlight is actually known to be very important, especially in the timing of reproductive cycles in many marine organisms, ironically in places very far from here in the tropics. Marine animals like corals use moon phase to tell them when to reproduce since the phases of the moon are almost like a clock in the sky. Furthermore the gravity of the moon (and to a lesser extent the sun) causes the rise and fall of the tides. These tidal signals are not only obvious on our shores but also penetrate deep into the ocean. Animals that live in the deep sea are in complete darkness and so they probably use tidal signals much like a calendar although we do not yet have much data about these mechanisms. We have found that here in the cold dark waters of Ny-Ålesund that lots of animals in the plankton migrate when the moon rises. This is quite a new finding and very exciting. So we see that the moon is indeed very important to orchestrate the behaviour of animals. It is like a clock for life on earth especially in the sea, and, as we have found, it is really relevant during the Polar Night. Marina Sanz-Martín, Kim Last and Gèrald Darnis. “Lo mejor del Sol, el brillo de la Luna”. escrita por Fito & Los Fitipaldis, no tenía mucho sentido. Lo mejor del Sol es su propio brillo y su maravilloso calor. 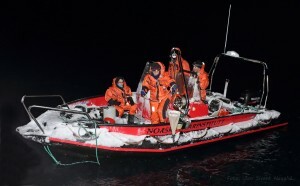 Después de pasar el mes de Enero en la completa oscuridad de Svalbard, primero a bordo del buque de investigación oceanográfica Helmer Hanssen y más tarde en Kings Bay Marine Laboratory, una base científica noruega en Ny-Ålesund , he descubierto la importancia de la Luna (ver otros blogs). Además, gracias a ella, hemos podido disfrutar de unos paisajes impresionantes. Del doctor Kim Last (investigador de SAMS en Escocia, especialista en los relojes biológicos de los animales marinos) he aprendido que la luz de la luna es realmente importante, especialmente en las temporadas reproductivas de muchos organismos marinos, irónicamente en los trópicos, lugares muy alejados de aquí. Animales marinos, como los corales, utilizan las fases lunares para reproducirse. Para ellos, la Luna es un reloj en el cielo. Es más, la gravedad de la Luna (con mayor influencia en la Tierra que la gravedad del Sol) provoca las subidas y bajadas de las olas. El oleaje, evidente en nuestras costas, también penetra en el océano profundo. Los animales que lo habitan viven en absoluta oscuridad, por ello es probable que utilicen los pulsos del oleaje como si de un calendario se tratase. No obstante, todavía no hay muchos estudios que identifiquen estos mecanismos. En las frías y oscuras aguas de Ny-Ålesund hemos encontrado que muchos animales planctónicos migran cuando la luna asciende. Este es un descubrimiento bastante reciente y muy emocionante. Por lo que hemos podido ver, la Luna orquesta el comportamiento de los animales. Actúa como un reloj, especialmente en el mar, y es muy relevante durante el invierno del océano Ártico o la Noche Polar como la llaman aquí. Marina Sanz-Martín, Kim Last y Gèrald Darnis. She was in a hurry. Time seemed to have slipped un-noted through her fins. It wasn’t the first time. But why was she here, then, in the icy Kongsfjord at 79° N, on a dark January day, nearly 12 degrees latitude from the traditional spawning area off the North Norwegian Islands Lofoten and Vesterålen? A 1300 km swim – against the ocean currents? Was it the seemingly immenseness of the task that had made her postpone the departure? Or had the surprisingly plentiful menu of shrimp, herring, capelin and haddock made he believe that she was in one of the Fjords along Finnmark, and not in Kongsfjord on the north-western corner of Spitsbergen? She felt the growing bag of roe pressing against her stomach inside her. Her appetite was not as intense now as it had been during the autumn months – but something told her that she needed larger energy stores to make it all the way. Always choices to make. Depart now and contribute to the next generation – or ignore the urge this time and stay behind and enjoy the bounty of food being offered? Staying with the noisy black and white birds, diving and flashing their dangerous beaks in search of food in the dimly lit water masses? – they had chosen to stay the winter here in the darkness, only illuminated by luminescent krill searching for food, the moonlight and the illusive northern light – could she do the same? A third option was to swim towards the more northerly spawning areas in Breivikbotn off Sørøya in Finnmark. “Little Lofoten” was the common name of this site – she had never been there. But this trip would be a bit shorter, and departure could be further postponed. But here in Kongsfjord she wasn’t on her own. Several handsome young males were in the same situation as her. Increasing pressure from hormones and growing gonads signalized next generation eagerly waiting to be conceived. Did they really need to go the long way to the coast of the mainland to breed? Wasn’t Kongsfjord an equally appropriate alternative?– an availability of food of all sizes and qualities, but probably water temperatures a bit on the cool side ?– and ofcourse the presence of the numerous, somewhat odd cousins, the polar cod, which clearly had chosen to breed on site in the darkness. She was 90 cm long, in good shape, ready and capable of the long swim. She had made the journey to Lofoten twice before, but never from a starting point this far north. She liked the trips to Lofoten, the feeling of being part of something beyond herself, the making of life. And her own offspring had also turned up here in Kongsfjord. The rich, pelagic concentrations of krill were ideal food for young cod, feasting fin by fin with haddock, capelin, redfish and herring, the former being the results of her and thousands of other mature cod spawning off Lofoten in spring 2012 and 2013. No – it had to be yet another voyage. But this time, the reluctance to depart proved wrong. The last effort on filling her stomach in the dense, pelagic food abundance led to an unexpected and fatal encounter with a researcher’s pelagic trawl. 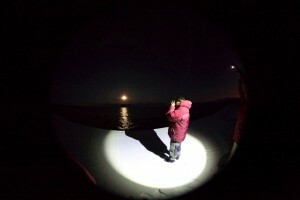 Her last contribution then was to stimulate curiosity among scientists and students working to describe and understand the polar night marine ecology of the Arctic. 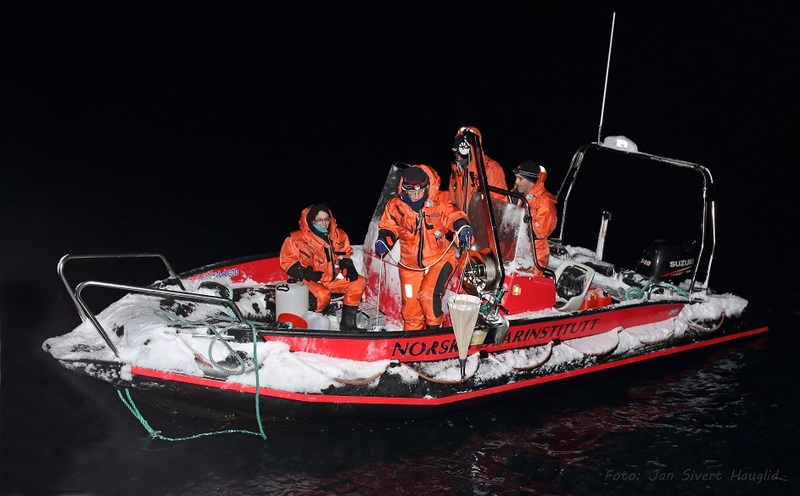 This little story is fiction and fantasy, but is describes how events could have evolved for the largest fish, a 90 cm female Atlantic cod, taken in one of 9 trawl hauls in Kongsfjorden, Svalbard during the ARCTOS research program Marine Night, January 2014. 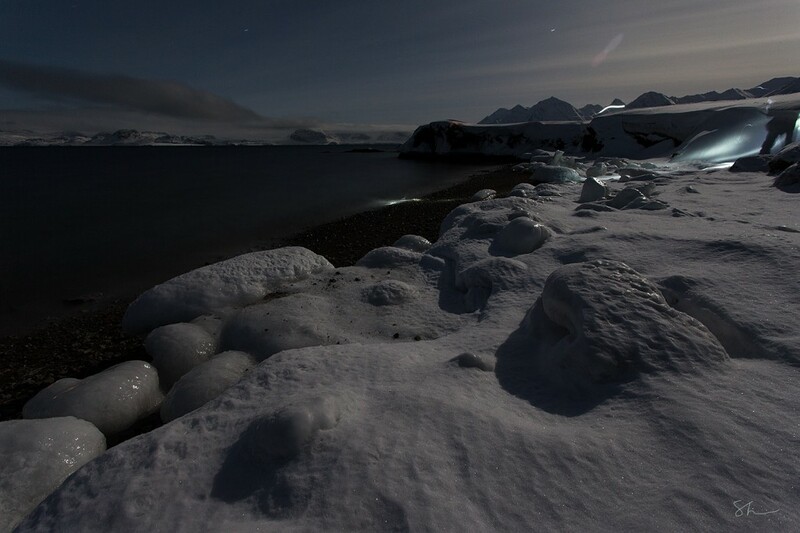 We are challenging the common perception that the polar night is void of life. 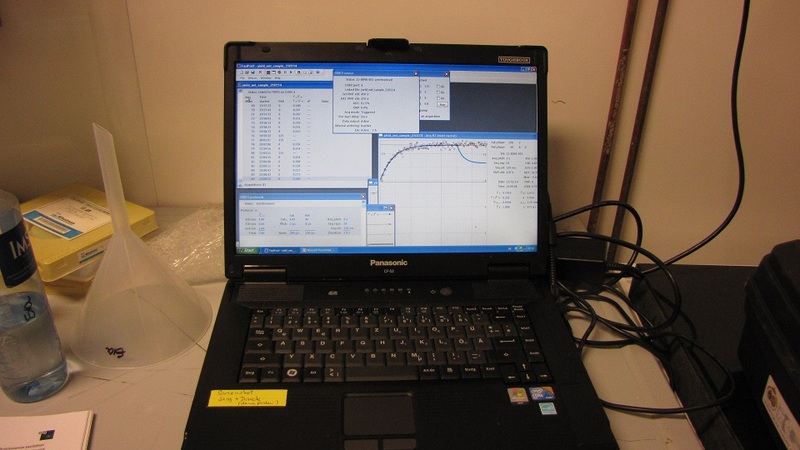 First, we measured the photosynthetic capability of macro algae in the extreme light limited environment. Surprisingly we found that the dark-acclimated macro algae were capable of utilizing light that was put into the system in a much similar way as light-acclimated macro algae. In addition, we deployed a time lapse camera for 60 hours, taking a picture every 5 minutes in an attempt to capture the biology in the system. 2 polar cods were placed on a rod in front of the camera to capture the scavengers active during the polar night. The results show significant biological activity on the benthos including whelks, amphipods, crabs, fish, etc most of which are feeding on the polar cod bait. The film is an example of how much polar cod has been consumed in a 12 hour interval. We expected significant bait consumption but we didn’t expect it to happen at such a fast rate, we were also unsure of the players that would be feasting on the polar cod. The film is a really good example of how active an ecosystem can be in low light environments. Comments Off on Mission impossible – ? When I started to tell my colleagues back home in Oslo that I will be going to Ny-Ålesund in January to measure photosynthesis in the dark, they just laughed at me. Photosynthesis is the process that algae (and plants) use to make biomass from CO2 and water, using the energy of sunlight. And there is the catch: how should anything like this work under permanently dark conditions, as we found during the Polar Night? – I wanted to do this in organisms that would be really hard to find in sufficient amounts. 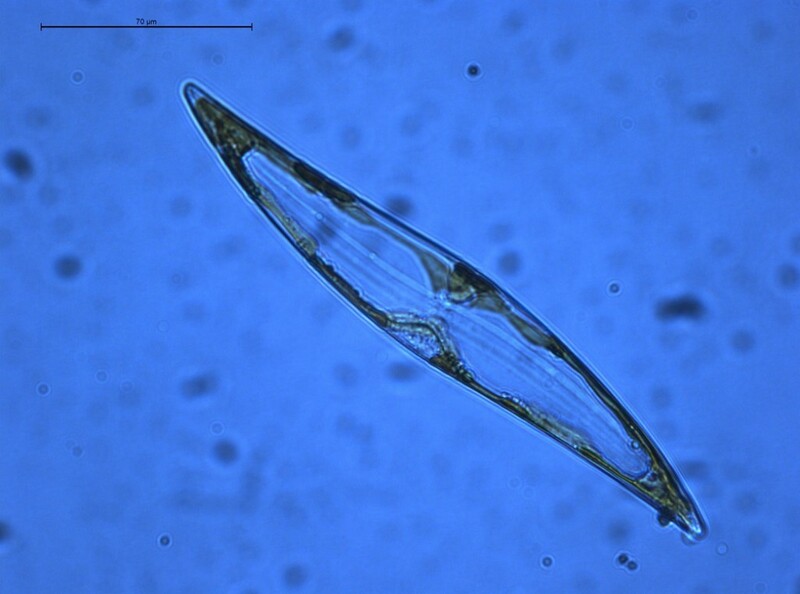 I had brought with me a really fancy instrument that should – in theory at least – be the only device that may be able to provide me with information about the physiological state of the algal cells out there in the dark – provided that I could find enough of them in the first place to gain a measurable signal. Not surprisingly, working in the dark Polar Night poses challenges in many practical aspects, as have been mentioned several times before – however, this is made even worse, if one not only wants to find an animal or an algae (like a needle in a haystack), but if you also need to get them back to the lab alive, undisturbed by any light (as you want to observe its activity under the current natural conditions, which are ….. – dark). From a practical point of view, this means you need to get very familiar with all the gear and instruments you want to use, and keep all tiny parts of equipment or clothing (like gloves!) right at hand – because otherwise you won’t be able to handle all this in the dark. Luckily, we can cheat a little bit, as it has been proven that red light does not affect the organisms as strongly as any other type of light. 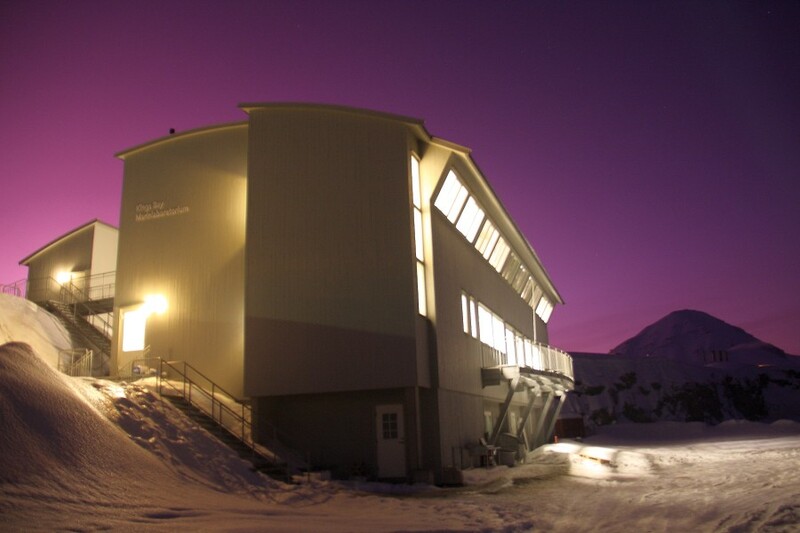 For this reason the lab area that is occupied by groups working on physiology of living organisms turned into the “red-light-district”, metaphorically speaking of course, with cold and dark rooms, where the organisms are kept under natural conditions, lit up only sporadically by red head lamps indicating research activities. 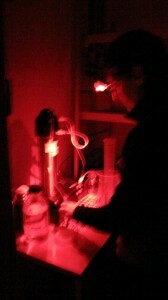 Getting back to the hunt for photosynthesis in the dark: it took a week to figure out that the way of concentrating up the water samples I had intended to use did not yield any measurable signals – and still I did not know whether this was due to there being too few algae cells, or that there simply was nothing to be measured. But after the the R/V Helmer Hanssen had visited us here in Kongsfjorden, my dear colleague Tove from UNIS lent me a tiny little net that I figured out could simply be towed slowly behind a boat to filter large amounts of water, thereby getting enough material to measure — simple story AND it worked! When the polar night appears black for most eyes and even sensors, new equipment is on board the UNIS course to measure the “unseen” light. Two new prototypes which just arrived before departure from the mainland, has now been deployed and tested for the first time. The results are surprisingly good and show clear variations in the light regime throughout the day. 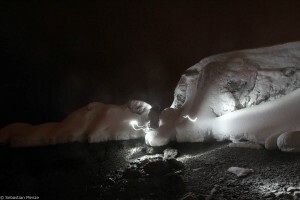 This means that the sensors are able to detect even minute amount of light during the polar night. Compared to commercially available light sensors today the new prototypes are many many times more sensitive. 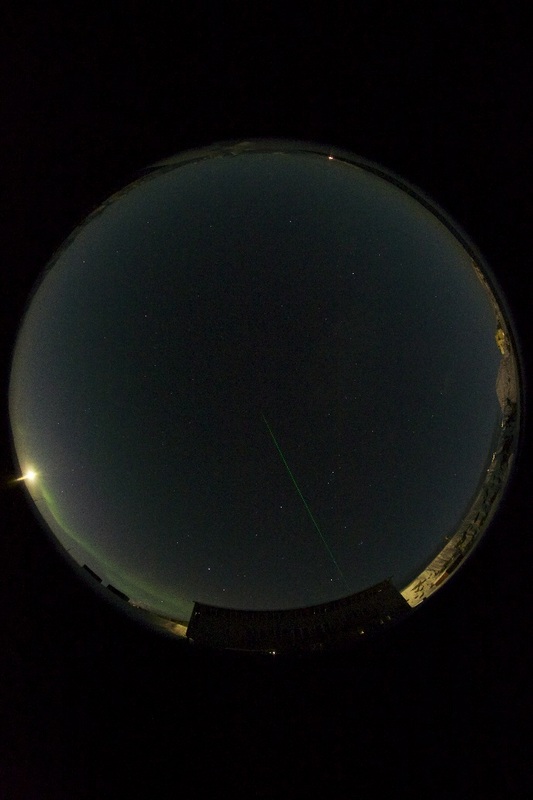 In addition to the prototype sensors we have mounted an camera that has taken a time series of the sky to visualize what we are trying to measure. The photographs are quite amazing as you can see. Dark is not dark! There is no doubt that the creatures of the night are active also in the long Polar Night. Check out this amazing underwater video by Robert Staven, shot during the Marine Night campaign just outside the Marine Lab of Kings Bay. Greetings from Ny-Alesund in Svalbard! As this is written we are surrounded by a very special phenomenon. It occurs during the arctic wintertime and is called the polar night. 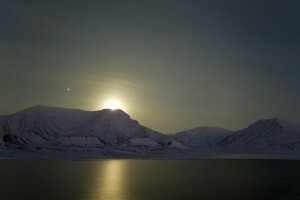 In Svalbard the polar night last for approximately two and a half months each year. 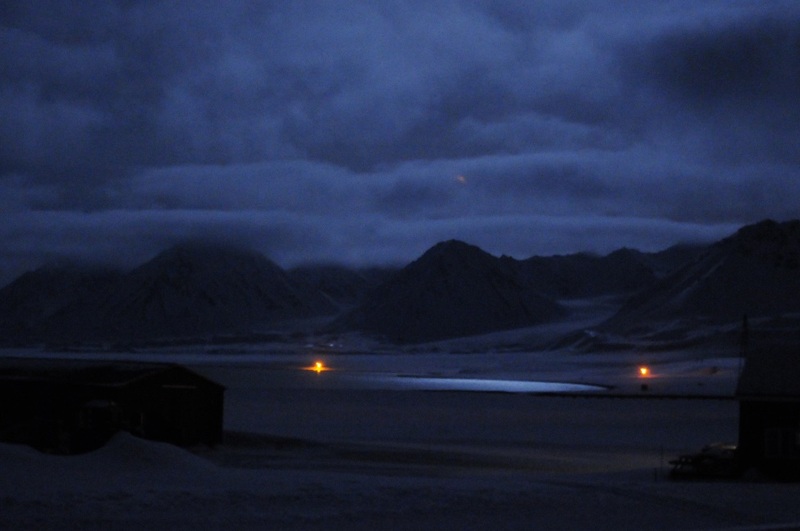 While people in other parts of the world start their day with the shining sun, the people of Svalbard and other parts of the arctic wake up in absolute darkness. The everlasting night has various effects on humans. You enter a kind of hibernation mode making it extremely difficult to get out of bed in the morning. We recommend a strong dose of self-discipline and a very persistent alarm (mine makes me solve maths problems before it gets silent). In the dark you also have a tendency to walk into things and fall over a lot especially if you forget your headlamp at home. Finally, your lonely morning walks, which might usually help clear your head become quite stressful as the thought of a nearby polar bear hidden in the deep dark has a way of disrupting tranquility. But the darkness isn´t absolute. 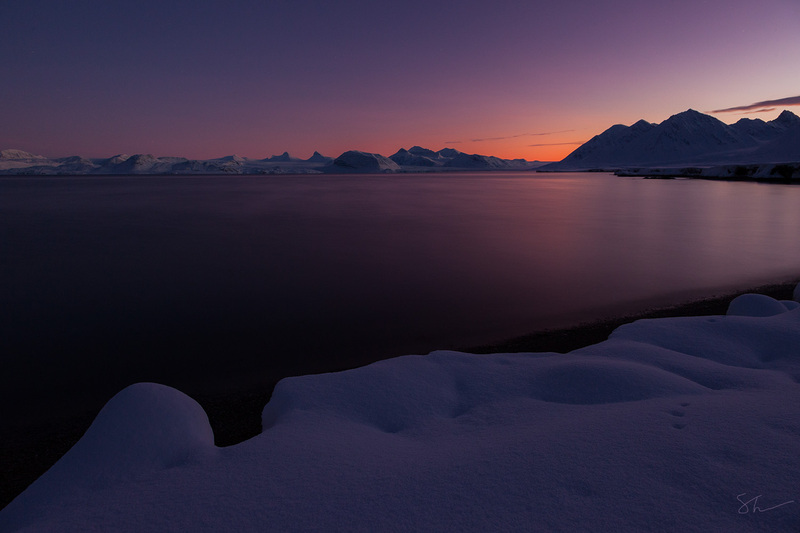 The absence of the sunrays allows other natural wonders of light to take over and transform the polar night. 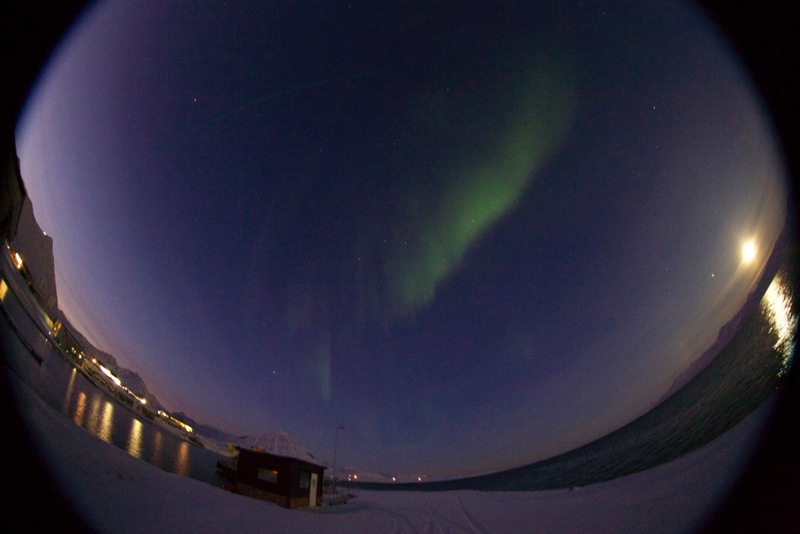 With a clear sky above you can eat your lunch under a full moon and dancing Aurora Borealis. Approaching the seasonal shift in late polar winter the irradiance of the sun starts to spice things up with fascinating colors. Besides the input of light by astronomical and geophysical events, organisms can also make their mark on the polar night. Luminescent organisms are very abundant in the ocean. In fact bioluminescence comprise one of two major light sources in the biological world along with the sun. As these various light sources are now being studied and measured for the first time we will soon unveil the numerous mysteries of the Arctic polar night. 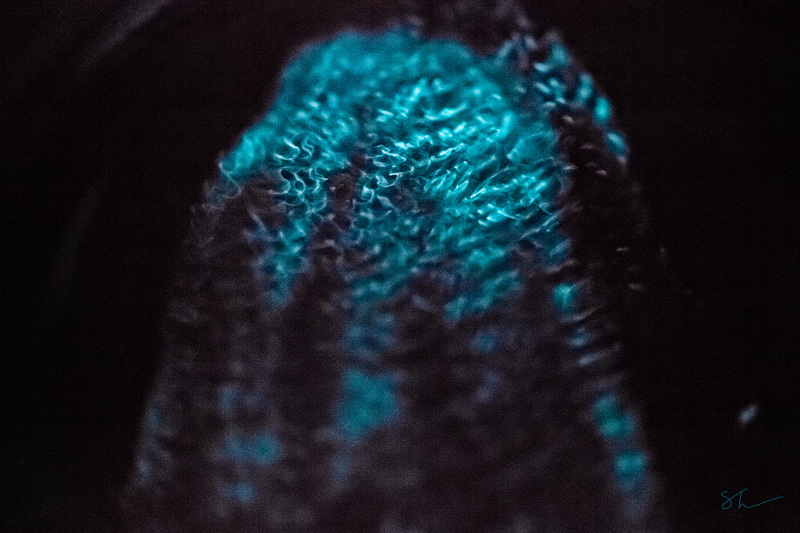 Is bioluminescence a defensive function or simply show off? Is there any hanky panky going on in the polar night? Stay tuned! We will bring you these answers and many more. Regards, Jóhann, Nína and Stuart. 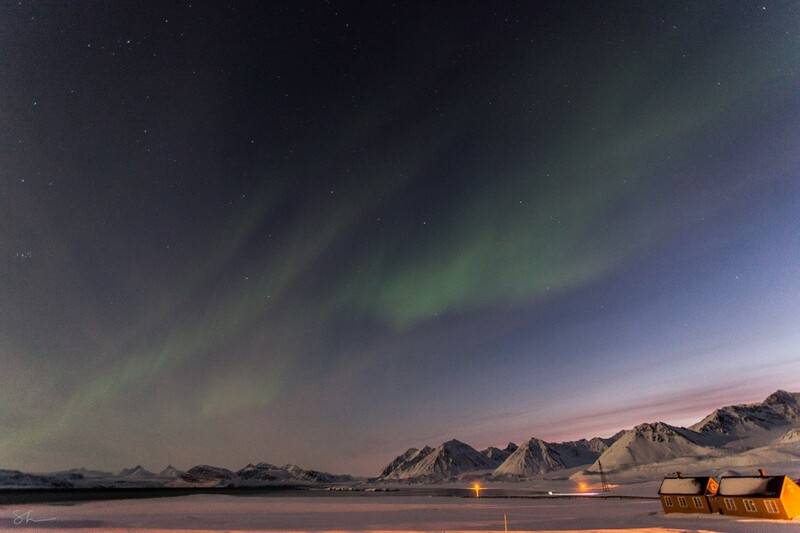 The Aurora Borealis serve as a light source in the skies over Ny Alesund. Picture: Stuart Thomson. A fantastic phenomenon of a red horizon in the polar night. Picture: Stuart Thomson. Beroe cucumis bioluminescence in the lab. Picture: Stuart Thomson. Our work in Ny-Ålesund has reached a new phase. A rather large amount of data is starting to pile up, and thus some time needs to be allocated to actually processing all the data we have. As there are a lot of Norwegians around, let’s take a moment to discuss the weather: it changes a lot. As a scientist, one must always be prepared for the possibility that plan B, C or D must be utilised because plan A is depending on good weather. A few days ago we almost lost the winch and a whole lot of precious equipment to the deeps of Kongsfjorden, luckily a brave scientist in training from Iceland demonstrated super rapid reflexes and near super human strength managing to save the winch and cage from going overboard and forever be lost. We now have a new (properly marked) wire thanks to Rupert with a buoy attached to the heavy cage and a safety rope on the winch itself. Sampling could not have gone more smoothly than it did yesterday. 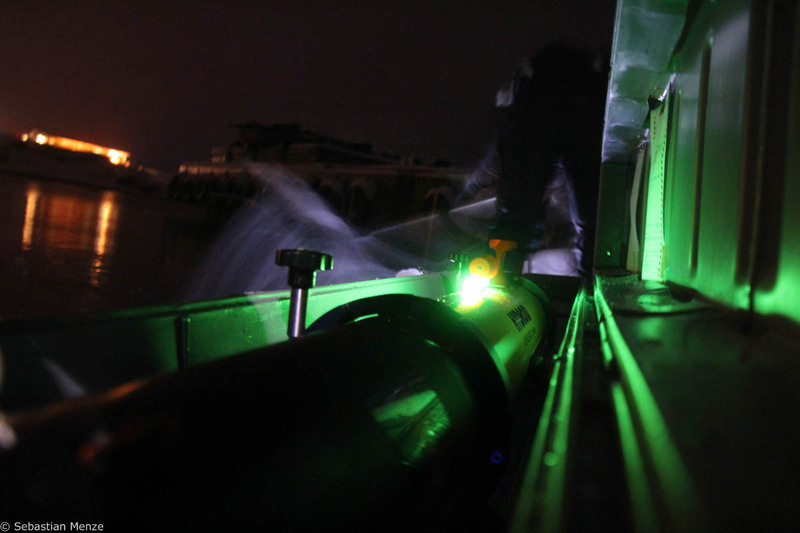 Everyone was happy, especially when beautiful bioluminescence flashes were seen during the transfer from the zooplankton sampling net to the bucket. Additionally, we managed to successfully replicate backscatter measurements with the AUV and confirmed the results from a previous study. Now we are preparing a mission to map the variability of zooplankton migration across the fjord. We started our course in Longyearbyen, Svalbard and have made our way to the world’s most Northerly settlement, Ny Ålesund. The journey to Ny Ålesund is quite an adventurous experience and involved a half hour flight over moonlit mountains in a very small plane. Not only is Ny Ålesund the world’s most northerly settlement but it is also the regular haunt for local polar bears and we are on the look out for any such curious critters who might want to “help” us with our science. As we are researching the polar night the darkness is really important and the management group of King’s Bay have done an awesome job of keeping the harbour area dark for us. Already we have been experiencing a variety of local weather conditions, with mild days and a little light snow. Light for polar night with a very awesome full moon, apparently turning us all into werewolves, an event to look forward to! We have also been lucky enough on occasion to see the Northern Lights (Aurora) in our Lunch break. We’ve been broken into 4 groups according to our interests and abilities and have spent the most of today going around and getting to know the equipment we’ll be using for the next 2 weeks. For some of us this involved getting excited about the robots themselves and for others we learnt about a million different ways you can detect and analyse light and the properties of the water column. We’re very much looking forward to the arrival of the University of Tromso research vessel, the Helmer Hanssen which is bringing with it some more awesome equipment and researchers. The ship arrives tomorrow and after the unloading we’ll get to meet all the other scientists who will be working with us on this campaign. Over the next few weeks we’ll be posting all about our research discoveries with the occasional anecdote in-between. Keep an eye on this blog for all the news and updates! Yesterday we left Longyearbyen with all our equipment, colleges and students. Months of planning and preparing have ended, and we are now in place in Ny-Ålesund where we will carry out the largest polar night expedition ever conducted (at least to our knowledge). It took us two and a half airfreights to get here, but even then we had to leave a lot behind. Fortunately there was room for all our students – the rest will come with group II on RV Helmer Hanssen on Thursday. We were met by a surprisingly mild weather – nearly clear skies and around 0°C. And no water. Or at least a critical shortage of drinking water in the settlement. 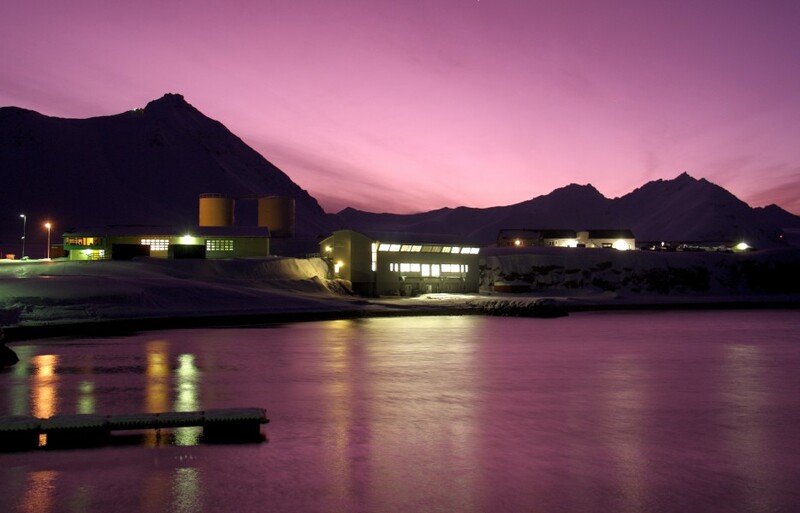 However, and more importantly, we woke up this morning to a truly sparkling polar night – no clouds, a bright and almost full moon, northern lights and a green laser beam from one of the research stations pointing straight up into the sky. The colours that filled the sky today was simply extraordinary and beautiful. Seeing this today, amidst all thinkable and unthinkable problems with instruments and gadgets reminds us why we are here – to lure away from mother nature some of the most well kept secrets on the planet, the secrets of the polar night. Using the best underwater technology available and a group of 21 motivated and inspiring young students. Over the next two weeks, this will be our main ambition. And we will focus our attention towards yet another source of light – the bluegreen light that so many marine organisms produce at this time; bioluminescence (morild in Norwegian). 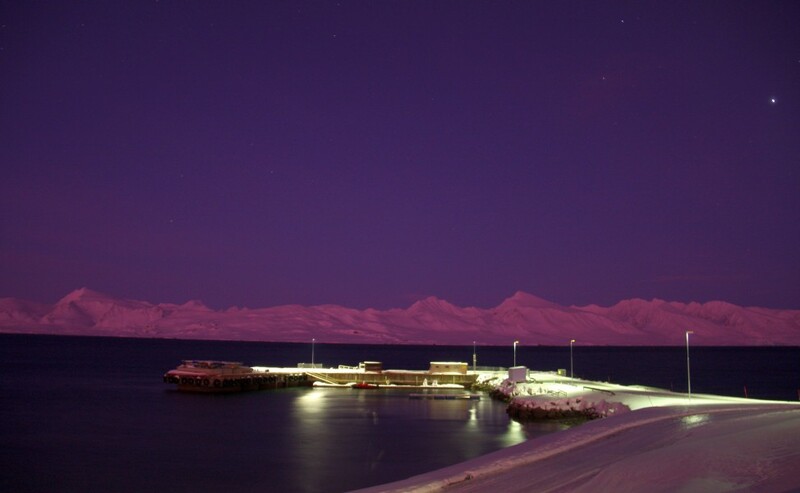 This kind of light is otherwise very well known from especially the deep oceans, but here at the high latitudes of Svalbard (79°N) it becomes a characteristic phenomenon also of shallow waters during the polar night. Why do organisms produce such light? What significance does it hold in the everlasting game between organisms looking for food and organisms trying to avoid becoming exactly that? And how do we measure it in real life in the ocean during the polar night? 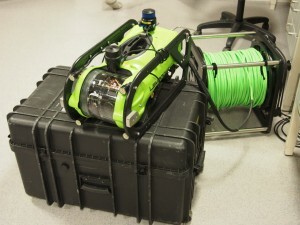 This will be our tasks over the next two weeks, and on the way we will deploy and use a wide array of underwater platform and sensors – most of which are brought up into the polar night in close cooperation with the AMOS Centre for Excellence on underwater robotics at NTNU. The expedition is lead by UiT, and the biggest component of the 65 man (and women!) strong team is a UNIS course on underwater robotics and polar night biology. At the moment, we are 32 researchers and students established in Ny-Ålesund, but our college Stig Falk-Petersen is coming up with Helmer Hanssen and 28 others on Thursday. 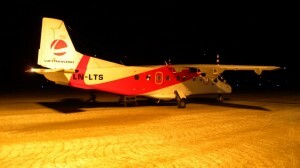 The last participants are coming with a plane on Friday. 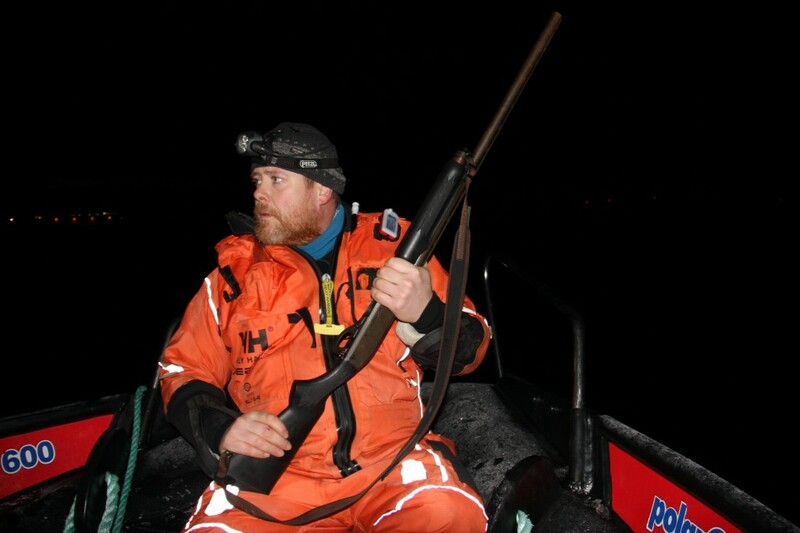 And together we will be searching for dark secrets all over Kongsfjorden over the next two weeks!